In a move that would improve anyone’s mood due to its hilarity, Samsung has filed a motion in court asking Apple to hand over the next iPhone and iPad. The reason for that is because they want to know if they are similar to Samsung’s own products and they would want to take measures from Apple from suing them again for copying their designs. The decision to perform this act of comedy is probably the result of Apple recently asking the court for Samsung to hand them pre-production samples of the Droid Charge, Infuse 4G, Galaxy S II, Galaxy Tab 10.1 and 8.9 so that they should also be part of the lawsuit that Apple filed against Samsung in which they claimed that the Galaxy S copied many design elements of their iPhone and to prevent those devices from entering the market. In this case the court sided with Apple and they got their hands on those pre-production samples. Do note that when we say “they” we mean Cupertino’s outside lawyers and not Apple’s. Apple is yet to take any action regarding that matter. Now the only and major difference in what Apple did and what Samsung is asking to do is that Samsung’s products were already publicly announced and some were even on sale. However, Samsung is asking Apple to handover the final, commercial version of the next iPhone and iPad that are still in development and not publicly unveiled. The reason because this is stupid is because they are basically saying they don’t want to get sued from Apple again for copying their designs, which is why they want to see their designs first and make the necessary changes. But if you remember, Apple sued Samsung for copying the design of their existing product. Why would they sue them for copying their design, when Samsung’s products are already out and Apple is yet to release them? In fact if they turn out to be similar, it is Samsung who should be suing Apple for copying their design and not the other way around as Samsung fears Apple would do. Also, if the designs do turn out to be similar, is Samsung actually going to pull their products from the shelves, go back to the drawing board and redesign their products so that they no longer resemble Apple’s? 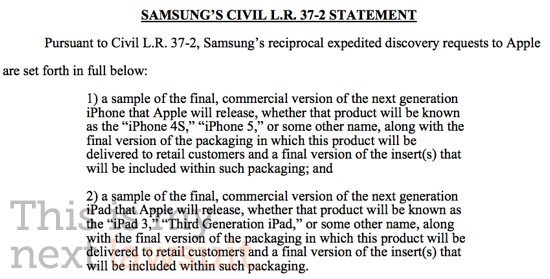 This whole thing reeks of revenge with Samsung desperately wanting to get back at Apple. That would have been fine had it not been so poorly thought out. I think it’s time Samsung hires better lawyers. Click on the source link below for more detailed information on the matter.